Grapes and Gusto™ | Gilat Ben-Dor · Cities and café culture: Who impacts who? Cities and café culture: Who impacts who? The lunch rush feels like a leisurely gathering in northern Tel Aviv's hip cafe, Zurich. 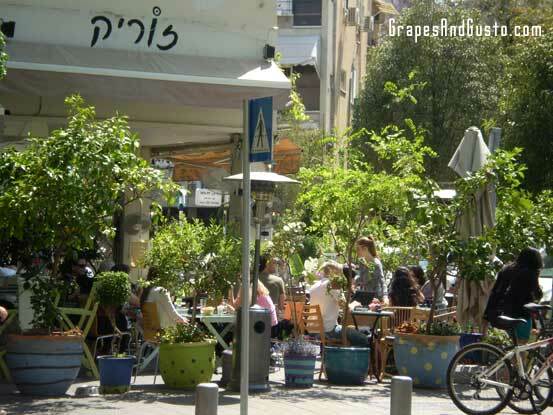 On a recent trip to Israel, it was hard to miss the fact that Tel Aviv, along with most of Israel’s cities, thrives on the energy and hub of the café. Quite similar to Europe, in fact. Unlike the Starbucks institution we know (all too well) back in the States, Israel’s cafés seem to have a different kind of energy. First, the cafés tend to focus on being outdoors, being part of a scene, of seeing and being scene – though with a surprising lack of pretension. While there were some laptoppers I observed in the Tel Aviv cafés, it seemed that most of the caférati were there to be in the moment – to socialize, or if alone, to take in their surroundings over an “upside down coffee” (kafe hafuch), a popular way to have your brew, with the coffee sprinkled over hot milk rather than having water poured onto the coffee first. Also, while there are several café chains in Israel now – Aroma, Café Hillel, CafeCafe, Arcaffe – there still seemed to be a very individual spirit to each café, and plenty of independent locations. Another note on Israeli cafes is that they focus on food well beyond the carb-laden, glass case offerings. You can often order a typical Israeli breakfast which includes tomato and cucumber salads chopped into painstakingly tiny pieces, with lemon and olive oil, as well as eggs, cheeses, and breads or even sandwiches. “Real” food for breakfast, if you will; perfect for the savory protein lover, like yours truly. © Gilat Ben-Dor. All rights reserved. 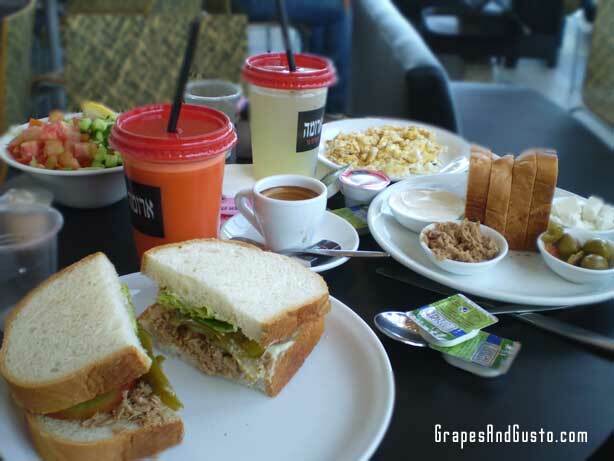 Typical breakfast fare at an Israeli cafe includes fresh, chopped salads, eggs, fresh-squeezed juices and sandwiches. Thanks, AlexAxe! Stay tuned for more travel commentary. © Gilat Ben-Dor & Grapes and Gusto 2009-2010. All rights reserved.